individuals, consistent with the aims of the World Sepsis Declaration and the World Sepsis Day movement. The mission of the Global Sepsis Alliance (GSA) is to provide opportunities for and be supportive of global interaction, such that the Global Community might address with equal commitment and vigor the needs of children and adults with sepsis in both the developed and developing world. It aims to provide the ability to speak with one united voice to offer consistent, easily understood messaging to governments, philanthropists and the public, and to easily identify and access resources and people of common purpose and intent within and without the scientific community with the goal of reducing the global burden of sepsis. 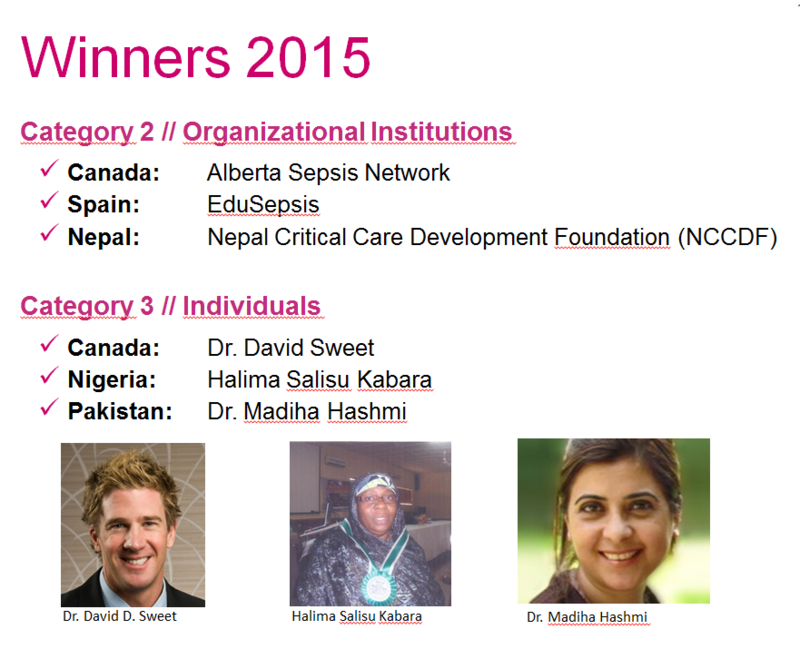 The Global Sepsis Alliance (GSA) and its Awards Jury have decided about the winners of the 2016 Global Sepsis Awards. 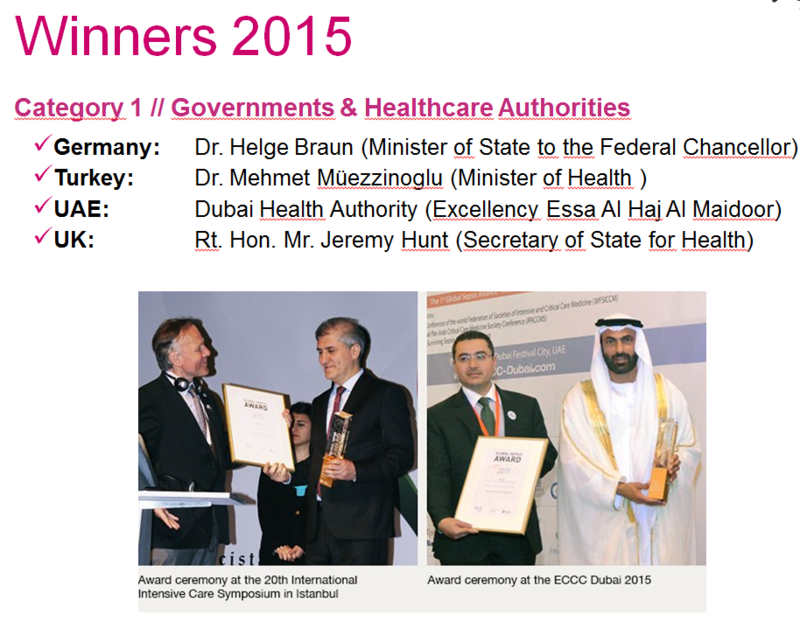 The awards will be presented to the winners in a ceremony in the context of international or national critical care meetings. Global Sepsis Alliance and World Sepsis Day decided to honor excellent sepsis awareness and education initiatives and to recognize major achievements of governments, organizations and individuals consistent with the aims of the World Sepsis Declaration and World Sepsis Day movement on an annual basis. 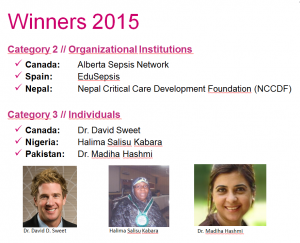 The application process for the Global Sepsis Awards 2016 has been closed! Due to the great number of excellent applications in 2015 in all categories, both from resource limited areas as well as from highly industrialized countries the Global Sepsis Alliance Executive committee decided to establish in Category 2 and 3 two prices: one for organization and individuals from resource poor or limited areas and one for highly industralized countries. Each awardee or awarded organization in Category 2 and 3 will receive an Award certificate and 2,500$ prize money.